Florida Splendid China ceased operations on December 31, 2003. This is a history website. 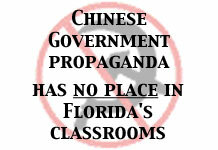 A group of dedicated volunteers who are against the inclusion of 'minority' and religious exhibits at the Chinese Communist Government owned and operated Florida Splendid China theme park in Kissimmee, Florida. Specifically, we are protesting the inclusion of the Potala Palace that was built by the Tibetan people and served as the home of successive Dalai Lamas since 1645, the Id Gah Mosque and Tomb of Abakh Hoja which serve as cultural icons of the people of Eastern Turkestan and the Mausoleum of Genghis Khan and the Mongolian Yurt exhibit which attempt to add a Chinese name to the Southern Mongolian people.